Having already gotten a cheese cave together I felt a certain amount of pressure to build a cheese press so that I can get some product in the cave and ageing. 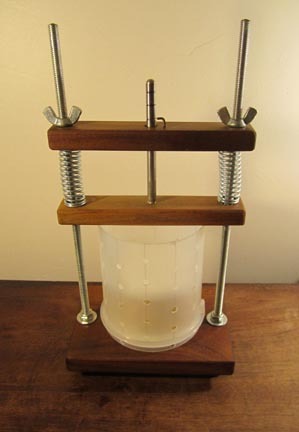 I built the first version of the cheese press in early December. Check out the how-to on Instructables for construction and use details. The picture above is of the Cheese Press-o-lator Mark II. I gave the Mark I away (but not before I tried it out) to inspire me to continue working out the design more. I want to continue to refine this press design until I am satisfied and then sell them. New for the Mark II, I changed the gauge which is now a rod sticking out of the middle of the top. There are grooves inscribed on the rod that denote every ten pounds of pressure. It’s a much more elegant design than the cardboard strip I had before. I have to admit that I haven’t made time to make any more cheese that needs pressing. I will though, the cave was being used most recently to cure pepperoni. I did make a great fresh cheese that got given away to friends at Christmas. Strain yogurt overnight in a cheesecloth (or any other cloth, t-shirts work well) until it has the consistency of spreadable cheese. I did it by tying the cloth around a wooden spoon and hanging it in a stock pot. You can also line a sieve with cloth and put it in a bowl. Mix in your favorite herbs. I used tarragon, thyme and cilantro. Garlic and rosemary wouldn’t be bad either.